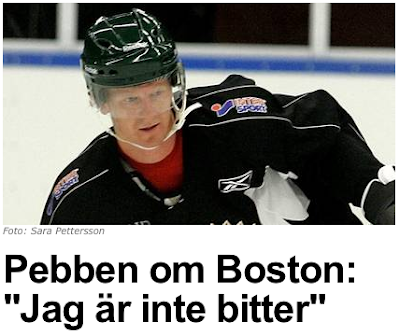 The Hockey Blog Adventure: Pebben about Boston: "I'm not bitter"
From sometimes commenter and fellow Axelsson fan sleza comes another translated Swedish article, this time from hockeyexpressen, which ran the interview on Friday. Per-Johan Axelsson had invested everything in for one more NHL year. But after 11 seasons in Boston he didn't fit (be good enough) anymore. - I'm not bitter. One knows that it's business what it's about, says Frölunda forward, who still hopes to land in North America during this season. When August turns into September and autumn unmercifully presses itself, Per-Johan Axelsson use to leave Göteborg for Boston. But instead of another season in North America, has hockey life taken him to Karlovy Vary and the Czech countryside to play with Tre Kronors (Swedish national team) in Czech Hockey Games. - I've always liked to play in the national team, so it's only cool and exciting. It's been awhile since the last time. National team tournament, which started well with a shootout win over Russia (4-3), is his first after Olympic gold in Turin 2006. When the end became clear with Boston, was Frölunda a obvious choice for 34 year old. Axelsson, who won SM gold (Championship in the Elitserien a.k.a. Swedish Elite League) with the club during the lockout season, has signed a 4 yeal deal. During his 11 season in classic Bruins, he was the player who was there the longest. After last season he was told that Boston was interested in to continue the contract with him, but in the end it came nothing. - I don't want to stay for just any kind of price, says Axelsson who wasn't specially interested in to change a club. Now stays the Axelsson family in Göteborg, daughter Wilma has started preschool and will get a sibling. How has the first time been? - Lots of training. But it's nice to work and accustom a bit. It's a very big ice coverage. it's a big difference. It's going to take a bit time but it gets better. Against Russia he played in the first line with "radar pair" (two players that play well together) Tony Mårtensson and Mattias Weinhandl. - It's the first time I played with then but I know what it's for players. A passing player and a sniper. So I'll try to stay away, says Axelsson and laughs. Even if there'll be no continue in NHL, is the goal for him to go to North America anyway. Head coach (national team) Bengt-Åke Gustafsson values Axelsson's qualities and Olympics in Vancouver in February is the great goal. - Yes, it's obvious. It has been extremely cool. I've been with two times earlier, says he. The move to home hasn't killed his Olympic hope. Just made the road there a bit longer. Thanks again for sleza for translating this for us. Yes, there haven't been many updates recently on here but nothing's been going on and I got a new job and apartment, so here we are.